A Festival of Drone Culture. The conversation continues, steered by rhetorical phrases like “trouble is” and “truth is,” and if the talk sounds familiar, that’s the point. Clarke may insist to his readers that Sting of the Drone is a work of fiction, but he offers that statement up as more of a wink than a disclaimer. Since unsuccessfully arguing for the use of military drones to kill Osama bin Laden, Clarke has been an outspoken critic of the “war on terror,” objecting more or less from the sidelines. Because it is fiction, Sting of the Drone gives Clarke the chance to bolster his theories with imagination, while insinuating throughout that his imagination could double as insight. In the author’s note that concludes the book, he even hints that he could have prevented 9/11. Clarke, whose nonfiction book Against All Enemies: Inside America’s War on Terror was a national bestseller, has also struck a chord with Sting of the Drone. Since 2002, when the first targeted drone strike against Al Qaeda was ordered in Afghanistan, drones have been at the center of America’s national-security policy, operating in countries where we have been at war, like Iraq and Afghanistan, and in countries where we have officially not, like Yemen and Pakistan. In spite of growing questions about the ethics of drone strikes, and an initial optimism about the foreign policy of President Barack Obama, the drone program has been greatly expanded since 2004; in 2012, there were as many drone strikes in Yemen as during the previous ten years combined. Recently, Obama referred to the strikes in Yemen and Somalia as models for the use of force against militants with the Islamic State (ISIS) in Iraq and Syria. 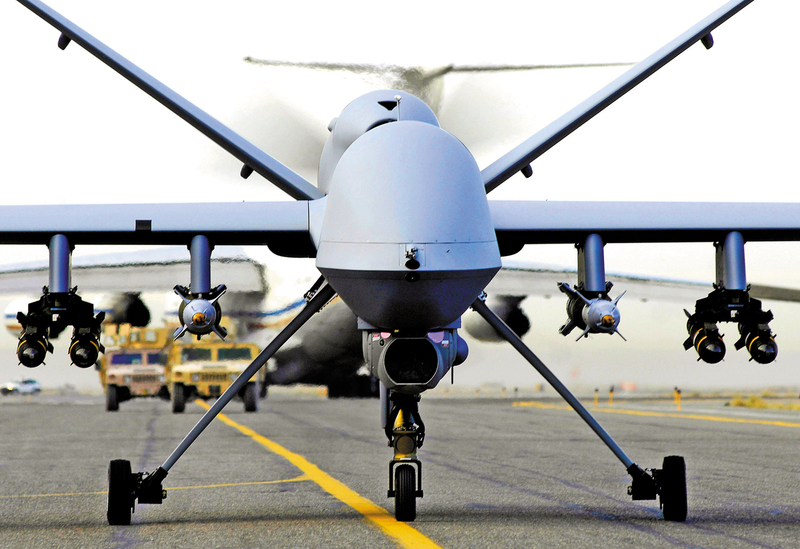 Drones are a military mainstay and a national obsession. To their proponents, UAVs are an exciting—and inevitable—technology. They enhance the US military’s ability to target foreign combatants while minimizing American and, ideally, civilian casualties. Their development has applications in nonmilitary fields such as science, medicine and retail (Amazon and Google tout the potential use of drones for same-day delivery service). And they are economical: an armed Predator drone costs a fraction of what it takes to manufacture and maintain a fighter jet. Critics say the drone program violates the Geneva Conventions and other international treaties that the United States has pledged to uphold. Drones may increase the likelihood of war, in part because they reduce combat risk for American pilots; the perceived low threat, their comparatively small cost and US dominance in the field make the use of UAVs all too tempting. Furthermore, critics say, the very presence of drones—the buzz of their engines and the violence it portends—traumatizes whole communities. In Khashamir, in east Yemen, villagers attribute sudden deaths and miscarriages to trauma from the ever-present drones. Human-rights groups have published book-length collections of such testimonies. Drones, these statements seem to confirm, recruit more terrorists than they kill. But for opposition policy-makers, journalists and activists, and even some supporters of drones, the most alarming aspect of the program is its secrecy, which not only obscures facts but also stokes paranoia—or complacency. It was only in 2012 that Obama publicly admitted the existence of the drone program while continuing to escalate the strikes, and Americans today are expected to reconcile the documented existence of drones with the official silence or denials on the subject. As a result, the debate on drones verges on the surreal, testing the limits of the American public’s connection to its own government as well as its influence over the waging of foreign wars. Emerging from this fog are fantastical political thrillers like Sting of the Drone. In recent years, not just in novels but in movies, television, poetry, video games and the visual arts, drones have taken on a life of their own. As a character, they are menacing, melancholy or gallant; beastly, blind, snub-nosed, noisy and fast—Predators and Reapers in real life, “Helicarriers” in Hollywood. They are the oversize hook at the end of a joystick, a militarized, antiseptic video game characterized by precision; or they are a weapon system proliferating at a breathtaking rate, and leaving a trail of destruction behind. They show off the military talent of their users, or they are an expression of unbridled hubris. They represent protection or extermination—and they carry out both things at once. Then the weapons turn on their maker: snatched by Iranian forces and emblazoned with American flags, the drones target an oil rig, an airport and a church. Some are meant to kill Americans, and others to ruin the reputation of the United States abroad. Amid the chaos, terrorism flourishes in the United States; in one pivotal scene, a Mexican ice-cream vendor unwittingly blows up Grauman’s Chinese Theatre. Maden exploits a fundamental worry about drones, one rooted in a strain of technophobia that appears in much of science fiction, from Mary Shelley’s Frankenstein to James Cameron’s The Terminator. Humans, by virtue of our boundless curiosity and intelligence, will eventually create a machine we cannot control. In Maden’s book, and in Clarke’s, that machine is the UAV, and it’s only a matter of time—and political miscalculation—before our drones attack us. And yet all these fictions, while diligently researched, are mostly far-fetched. It’s not necessarily the fault of their authors; drones take on the gloss of fantasy too well. Genuine expertise—a background in the military, government, political science or journalism—and plots intended to serve as warnings or political critiques do little to differentiate these drone entertainments from other, less topical science-fiction or technological thrillers. The genre conventions overwhelm the message. In Sting of the Drone, Erik grows increasingly anxious about losing control of the weapons. “It’s like something’s shifted. Like the bad guys are figuring us out, like we’re not quite invulnerable anymore,” he tells Jennifer. This may be true to life. But in the novel, his cautionary words are less a comment on American hubris than a familiar literary convention: the rote speech delivered by a fictional hero in order to disguise the inevitability of his victory, purely for thrills. Adam Rothstein, author of the forthcoming book Drone, responded to Cole’s tweets on the United Arab Emirates–based website the State, calling fictional work like it of the “utmost importance.” Such writing, compared to the whirlwind of thrillers—which suffer, anyway, from a dearth of information—could have a profound reach, Rothstein thinks. Curating and writing about work that incorporates drones, as well as exploring the connection between drones and people beyond the offerings of science fiction or political thrillers, became his focus. “Dronestagram,” one of the most compelling projects compiled on “Murmuration,” is a visual and cultural link between the Instagramming American public and the areas targeted by drones, as well as a method of compiling a death toll—a daunting task given the clandestine nature of most of these attacks. Beneath an aerial photograph showing the patchwork of flat roofs in a small Pakistani village, a caption provides the tally of people, both targets and civilians, killed or injured in the drone attack. In Tappi village, according to one “Dronestagram,” three to five people were reported killed, including one civilian, in a drone attack on October 24, 2012. “Three cows intended to be sacrificed for Eid were also killed,” it notes. “They were angry about the constant presence of drones over their heads,” Shiban told me. “A lot of them were addressing the fact that we have no other way to fight these drones. But we have our words, and expressing ourselves.” The prize for the winning poem was $600—or, as Reprieve pointed out, a mere 1 percent of the cost of a Hellfire missile. In Yemen, poetry is a written and oral tradition that knits together a society otherwise composed of many disparate communities spread over a large and geographically diverse terrain. In recent years, drones have made their appearance in poems as well as in street art. In Sanaa, a well-known piece of graffiti depicts a child asking a drone, “Why did you kill my family?” The same artist also plastered images of drone victims on walls around the city. The poem is a landay, folk poetry sung among Pashtun women along the border of Pakistan and Afghanistan. Traditionally, the twenty-two-syllable poems were performed over drumbeats at weddings and other gatherings, but decades of violence, and the Taliban’s oppressive rule, have made such performances rare. Today, landays are still collected and shared, but more privately. I Am the Beggar of the World is a universe away from Sting of the Drone, despite the fact that both have armed drones and the “war on terror” at their core. It’s not just that Clarke is vastly different from the female singers of landays, which belong to a distinctly foreign literary tradition, or that he has very different goals (one of which, presumably, is to sell books). Drones are two separate objects in the American versus the Afghan imagination. In the United States, drones are all too often a metaphor, the indirectness made more profound by the literal distance between a vehicle and its pilot. Drones symbolize a lot but seem to do very little. However, the same drone in Afghanistan exists as a fact of life, one that embodies real tragedy. There, a drone is a drone.